Every once in a while, even still in the 21stcentury, a game designer creates and introduces a true innovation. When this happens, it creates all kinds of buzz and stirs up not a little industry talk as gamers clamor to read about, see, and get their hands on the latest “hotness.” Then again, of course, another segment of the hobby contradictorily lashes out, arguing that there is really nothing new in gaming – and that actually what everyone thinks is a novel mechanic is just a variation of what “so-and-so” has already done in “such-and-such.” Today’s mechanic often finds itself in this scenario and has met with mixed reactions throughout the hobby. But at least it gives us something to talk about, right? The Rondel: How Does it Work? The “classic” rondel is a circle divided into a number of spaces – a pie with slices. I use the word classic because there are some still more recent variations that use a rectangle divided into squares, but which operate in the same manner. Each space of the rondel has an action and/or resource(s) and each player has a personal marker that moves around the wheel. Whatever space your piece lands on grants the specified action and/or resource(s). There are two predominantly defining characteristics to moving around the rondel. First, there are a designated number of spaces that you may move for free on your turn. Usually this limit is a low number, perhaps even 1, in order to prevent wildly whirling around the wheel. Second, despite this movement limit, the design typically allows you to move additional spaces at a cost, which varies between games that employ the rondel. When first introduced, the rondel was indeed a unique and visually distinctive mechanic. Admittedly, it is in many respects a derivative of the action selection mechanic. Therefore, thoughts regarding the design’s originality are diverse. However, most action allowance designs give players the full range of options each and every turn. Rather than just being a slight modification of that, the rondel is distinguishing enough to warrant its own examination here. Mac Gerdts unleashed the rondel onto the hobby community in 2005 with Antike. As the “Father of the Rondel,” he incorporated the mechanic in another five of his designs, by far the wheel’s greatest champion. His latest is the 2012 two-player only version of that inaugural creation – Anitke Duellum. Antike employs a straight-forward rondel element in empire-building. The wheel has eight slices on which you can move 1 to 3 spaces for free. Beyond that, you may also pay a resource per additional space. Here, the rondel is a pure action selection mechanic as each space designates collecting one of three specific resources, building up your military, erecting a temple, or advancing in science. Then two spaces allow for moving your forces on the board. Therefore, it’s hard to specialize in any one area and strategy requires some planning. 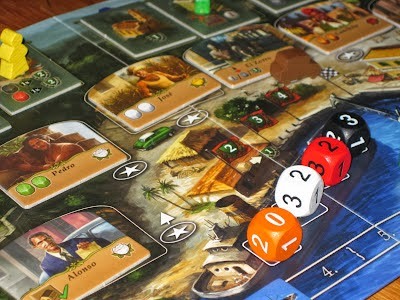 Guatemala Café (2007) was a first in the rondel mechanic for three reasons. One, the mechanic isn’t round! Instead, the rondel is actually a track that rings one of the square boards. It still operates in the same manner as Antike – you can move 1 to 3 spaces for free and pay for extra after that. Second, the marker that actually moves around the rondel is communal, rather than each player owning their own pawn or meeple. Finally, rather than stipulating an action, the spot you land on grants you the choice of producing a particular resource, depending upon the column or row. This was the first use of the rondel as a resource allocation component. The later, and much heavier, Vinhos (2010) uses another non-circular, communal 3×3 grid of action squares in which you may move one space for free and pay for additional moves. Another title published the same year to use the rondel for resource distribution was Vikings. It was unique in that there are no player pawns. Instead, twelve tiles and twelve Viking meeples are placed one each on the dozen spaces. You can take the first available set for free or pay an increasing cost for any combination after that, which decreases the cost of ones following it. This sort of basic distribution coupled with changing resource values was similarly employed in Ora et Labora (2011). The rondel can also be “personal” – that is each player has their own wheel, or equivalent, so that its effects and/or operation are customized through play. Macao (2009) was perhaps the first title to adopt this concept. Using a “windrose” for resource distribution, there are no moving pawns, but the mechanic restricts what you can collect and when. You can choose colored dice, but must place them on your own rondel a number of spaces ahead equal to the value of the dice. Therefore, taking higher numbers nets you more resources, but you must wait longer turns to get them. For such a recent and relatively infrequent mechanic, the rondel has still seen plenty of variations and twists. Shipyard (2009) employs four separate rondels as part of available actions to choose. Finca (2009) uses an interesting rule to move on its “windmill” – you move a number of spaces equal to the number of meeples on your starting point and then collect a number of fruit equal to the number of meeples on your landing spot. Trajan (2012) combines its rondel with a Mancala-style mechanic. Milestones (2012) makes use of personal, rectangular rondels for both resource collection and actions, but gives players a bit more freedom to move – two stops around per turn, but there is one mandatory stop each circumnavigation of the board. The rondel might not be insanely popular or extremely influential. Yet it is innovative in its own right. And despite such a simple concept, there is still plenty of study and experimentation left with the mechanic. The rondel certainly has yet to come full circle. Santiago de Cuba’s giant, communal rondel. The rondel visually illustrates not only the kinds of actions or resources that you can take, but their availability, as well. The design can be very intuitive and easily understood as everything is marked out in an organized manner right there on the game board or your personal mat. This helps to reduce both the learning curve and analysis paralysis. Typically, not all of the spaces will be available for you each turn. So, with fewer options to choose from, decision making is usually quicker. However, it still creates some nice tension, since you’re not always able to do everything that you would like. It requires some forward thinking; but such planning is manageable because the rondel and its action spaces remain fixed and consistent. You can always see which actions are coming up next. The mechanism is also effective in discouraging specialization, since you’re not able to constantly repeat the same action turn after turn. It’s a unique strategic perspective and challenge not found in other designs. Aside from pure action selection, the rondel can also be a good way to assign and allocate a game’s resources. Again, players can see what’s available and where – or when. They generally have the same access. Plus resources can appear randomly or change up, offering variety from game to game – or even within a current session. Some hobby gamers won’t like the restrictions a rondel imposes. Again, not all options will be available every turn. Therefore, what you want to accomplish in a given turn may not be available. And for those games that only allow one free advance, the next action in line could actually be worthless to you at that given moment. In these cases, the option to pay money, points, or resources to move further would seem more like a penalty. Instead of tension, players feel as if they’re hands are tied. The rondel can also inadvertently compound a runaway leader problem. Namely, the mechanic whereby one can pay a specified cost to advance farther than the normal movement allowed tends to favor the current leader. If you have more resources, you have more freedom to move about the wheel. It’s not a tremendous imbalance, but the additional flexibility grants an advantage to the leader that continues to feed upon itself over the course of a session. A final drawback or nitpick to the rondel is that it is arbitrary and doesn’t make thematic sense. The layout of available actions or the distribution of resources is purely a designed element. The rondel’s pattern never really ties in with the game’s story or narrative. There is no logical explanation, for example, as to why only the next one to three actions are available to you, and why you should have to pay extra for the opportunity to choose an alternative beyond those spaces. The same is true of trying to explain the rondel for use as resource allocation. The rules just say to do it that way. Going around in Milestones – the personal rondel. As the title that introduced the rondel to the gaming world, Antike is definitely worth checking out if you’re interested in the mechanic. It is also regarded as a nice, light civilization-building game in its own right. Imperial was the immediate successor to Antike, and is the highest rated title on the Board Game Geek database (at #55) that uses the “classic” rondel as an action selection mechanism. Shipyard is a more complex design for those wanting weightier strategy. It is also unique in that it has not one, but several rondels with varying influences affecting the game’s development. Ora et Labora is the highest rated title with a rondel on the BGG database (#23). The design meshes a few different mechanics quite well, and just uses the wheel to distribute resources, rather than resolve actions. The manner in which players collect resources from the rondel determines their values. Santiago de Cuba is a rondel game that doesn’t look like one. 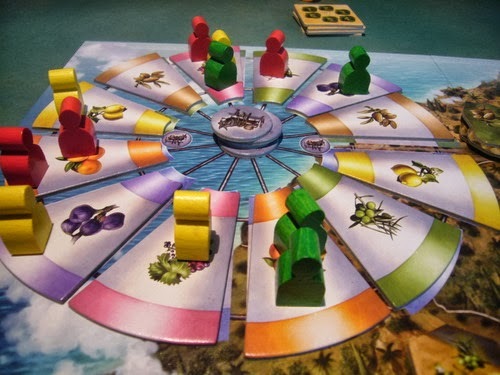 The common “rondel” is set up from game to game with the various people players can visit by taxi, each person granting the player some advantage, as well as access to a color-coded building that provides another advantage. Players may always advance the taxi one space for free; each additional space costs a peso, and each trip around the rondel increases the price of goods sold. There is interesting tension in manipulating the common rondel to your advantage (and everyone else’s disadvantage). Milestones uses the rondel concept, but on a rectangular track, to collect resources and take actions. The other unique element is that each player has their own, personal rondel. Instead of a free movement allowance with additional spaces costing extra, you get two stops on your rondel each turn. However, there is still a mechanic to prevent circling the rondel in that the last spot is a mandatory stop. Here’s a brief timeline of titles using the rondel. This is by no means a comprehensive list, merely a representation of some popular, unique and/or significant games utilizing the mechanic. What do you think about the rondel mechanic? Do you have other thoughts about its benefits or drawbacks? Perhaps you have a favorite title that’s not on our recommend list or the timeline? *Special thanks to BGG user Luisjoey for permission to use the opening image of Finca’s rondel. It’s certainly an interesting element of game design. I own and enjoy Glen More, and would like to play Navegador, Shipyard, Ora et Labora, Vikings & Macao. The rondel is one of my favorite mechanics. The elegance of a little mini-machine in a game is a wonderful control for some of the fiddliness in games. thank you for your article– i’ll watch for your next one on twitter! 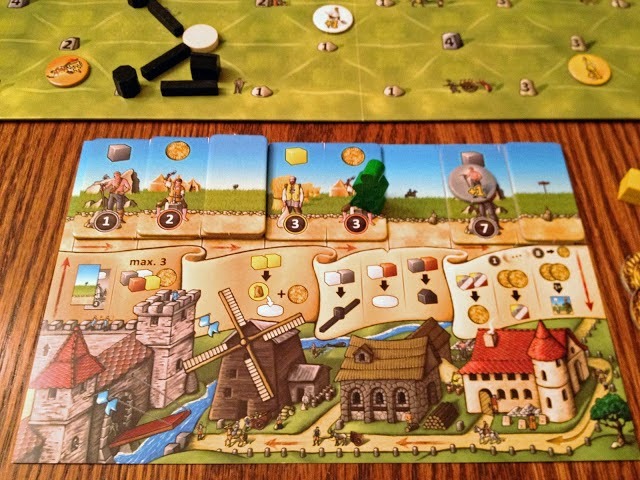 Pingback: Designing Action Selection Mechanics - Henges of Stone, Part 1 | This blog will self-destruct every Monday, Wednesday and Friday. Vinhos has a Rondel? I haven’t played, but I’ve poured over the rules. I don’t recall a Rondel mechanic. That being said, I recommend Seeland as a gateway Rondel title.